Sometimes you stare at the future and you know it will happen. That’s what I heard people looking at VTOL and eVTOL at Heli-Expo in Atlanta this month saying. Vertical Take Off and Landing and their electric-powered counterparts are that future. How do we know? Uber is investing heavily in urban air mobility through its project Elevate. At its next Elevate Summit in May, Uber will bring together industry leaders to try to induce more collaboration across manufacturers, researchers, academia and regulators. Bell, Airbus, Joby, University of Maryland, Georgia Tech, NASA, among others, are already on board. Several experimental designs have been flight tested either in model or in full scale. Joby, one of the most engaged companies, has already demonstrated a battery electric VTOL. The Workhorse Group, has tested a prototype of their SureFly hybrid in the open and posted its very short flight on YouTube. SureFly is a VTOL with “e” capabilities. While the eight rotors are powered by a generator driven by a 600cc Honda engine, there are 5 minutes of lithium battery power available in case of emergency. SureFly the personal helicopter/EVTOL aircraft designed for safe and easy flight – completely conceived, designed, built and tested in America by Workhorse – has taken flight, completing its first successful, manned, untethered hover outside of Cincinnati. This video is a progress report of the past few months’ work leading up to lift off. Workhorse is the only company with the necessary FAA experimental certification to test this type of vehicle in the United States. The team is working closely with the FAA, which had a representative on site for the test. 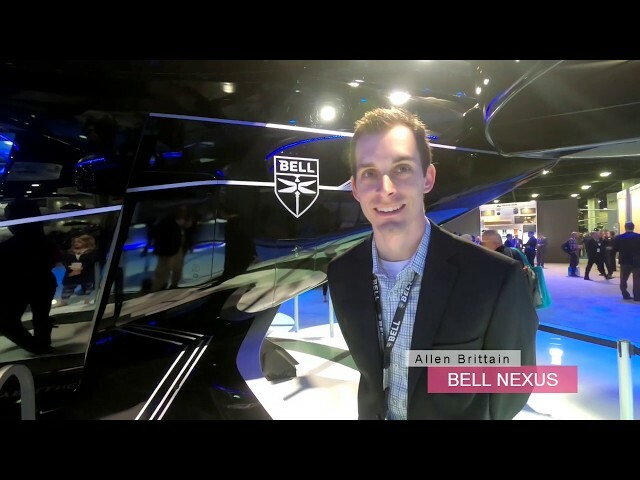 An interview with Allen Brittain from Bell, discussing the development of the Nexus eVTOL controls, guided by gaming and simulation. Bell indeed should know how to develop new and complex aircraft. We recently flew the simulator of the V-280 tiltrotor, which uses a set of controls that are half rotary, half airplane, plus some extra unusual bits, like a small rocking switch to transition from vertical to horizontal flight. Robert Freeland, Bell’s Director of Business Development gave us a simulator demo of the V-280 and noted: “The computer does it all. You have to tell it where to point and how fast you want to go and it manages the intricacies of controlling two very large propellers, tilt them as needed and send you on your way.” The simulator ride was indeed impressive and so was the entire design of the machine. Robert Freeland flies the Bell V-280 tilt-rotor simulator at I/ITSEC 2018. Datta seems to be more cautious about gigantic leaps to completely different control setups: “We need to keep at least the same vertical handling qualities as today’s VTOL aircraft while augmenting agility, gust tolerance, and autonomy for obstacle avoidance. The pilot interface of these platforms should have the functionalities to encourage existing pilots to want to move to them but simpler and more intuitive features suitable for the average learner. The missions are simple so flying should be simple.” Datta is organizing and teaching a four-hour short course on eVTOL on May 14. Attendees will look at a number of issues related to eVTOL construction including hybrid-electric power plants. Then again, accommodating the pilot may be an irrelevant consideration in the future. These could be totally unmanned vehicles like the trains at the airport. Ergonomics may not apply at all a few years from now. Priorities will be energy consumption, passengers’ loading and recharging point locations, traffic conflicts (that humans may not be able to manage), and above all, safety. With major companies like Airbus, Sikorsky, Boeing and others bringing their brainpower into this development sprint, Datta seems to think that a generic model will emerge which will drive the standard thereafter. In the meantime, we can imagine that many manufacturers will experiment and test a number of controls solutions. The SureFly video offers a glimpse of fairly conventional arrangement but, of course, ultimately it is all about the software controlling the flight and engine parameters. Like we did for the V-280, we are looking forward to seeing the upcoming generation of VTOL simulators, which will be on the front-line of training and in this case, very likely, will be instrumental in getting this brave new world to become reality.